Johannesburg - The London Olympics have been South Africa's best ever, Sports Minister Fikile Mbalula said in Johannesburg on Monday. "We want to congratulate all athletes for their single-minded focus and effort during the Olympics. The collective performance of our team has showcased the determination of all our people to succeed no matter what the challenges we face as a people," he said in a post-Olympic Games briefing. South Africa's apartheid history and decades of isolation as international pariahs. The six medals showed that the SA Sports Confederation and Olympic Committee (Sascoc) and sports federations going "back to the drawing board" to strategise after the "debacle" of the Beijing Olympics had produced positive results. In those Olympics long jumper Khotso Mokoena won the only medal, a silver. The country's performance was "indicative of the smooth transition of the country and the trust that our people have put on our national teams to succeed". Although it did not reach the 12-medal goal set by Sascoc, the medals should be treasured. He said Uganda had won just one medal and would probably "party for a year". He also paid tribute to the athletes' families for supporting them. Runner Caster Semenya won silver in the women's 800m, Bridgitte Hartley won bronze in the women's kayak single K1 sprint, and rowers Sizwe Ndlovu, Matthew Brittain, John Smith and James Thompson won gold in the men's lightweight four. Swimmer Chad le Clos won gold for the men's 200m butterfly, and Cameron van der Burgh for the men's 100m breaststroke. Le Clos won another silver when he tied for second in the 100m butterfly. Mbalula singled out some of the athletes - Anaso Jobodwana for qualifying to run against Jamaican sprint legend Usain Bolt, and javelin-thrower Sunette Viljoen for narrowly missing a medal. Long term-term planning and investment was needed for a higher medal yield, he said, but not at the cost of providing services such as water in South Africa. He said the department would lobby the government and the private sector to invest more in the future of sport in South Africa, as well as getting more women involved in sport. The National Sport and Recreation Plan was already underway, and there was a "junior Olympics" plan to identify and nurture talent at schools. Speaking on the sidelines of the conference, Sports director general Alec Moemi said the department gave Sascoc R48 million for Olympic preparations - R12m a year in the four-year build up. In addition, Sascoc was given a special grant of R37m this year to boost athletes' preparations. The department had to help with other funding, such as when the men's hockey team stood a chance of qualifying in Japan, and when Banyana Banyana needed to go to Ghana and Germany. Swimming SA was given R3m. Money was given to the rowers, the tennis qualifiers, and the paralympics, among others. The Lotto and sponsors such as Telkom also provided funds, he said. 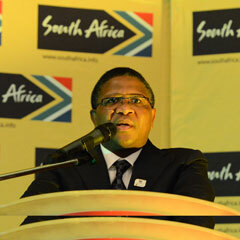 Mbalula said a final tally of costs would be available later. He would not revisit the question of whether the department had paid for expelled ANC Youth League president Julius Malema's trip to London, saying that had already been clarified. On August 3, he said the department did not.